Thorsten: Why have you decided to tackle Kona after working so hard for an Olympic medal? Sarah: After a rough Rio experience, both in terms of build-up and race, it took me a while to bounce back. I realized that I was too heartbroken to continue with ITU. After a few 70.3 races last summer, I realized that I enjoyed the non-draft racing, too. Last October, the desire to race at Kona hit me strongly. I love this sport and such a huge part of it centers around the IM World Champs. 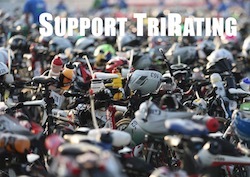 I felt like my career would never be complete without racing at triathlon’s biggest race. T: You’re being coached by Dan Lorang who also works with Jan Frodeno. How did you end up with a German coach? S: Dan and I started working together in December. I’ve respected Dan for years and it occurred to me that it would be important to have someone who understands the ITU background well in my transition to long-course. He has experience in coaching ITU and IM and has successfully transitioned athletes between the two. He’s also a really good person of high integrity and that’s of utmost importance to me. T: How much has your training changed since switching your focus? S: I was actually surprised by Dan’s approach; we’ve done more intensity and less volume than I expected. I was very nervous going into my first IM since we hadn’t done any long, hard rides or runs, but I trusted his experience. The biggest change that I’ve really liked is that I do little training on easy days. As an ITU athlete, my easy days would still be multiple workouts and I feel as though that impacted my ability to do hard days well. My big days are bigger with IM training, so my easy days are smaller. 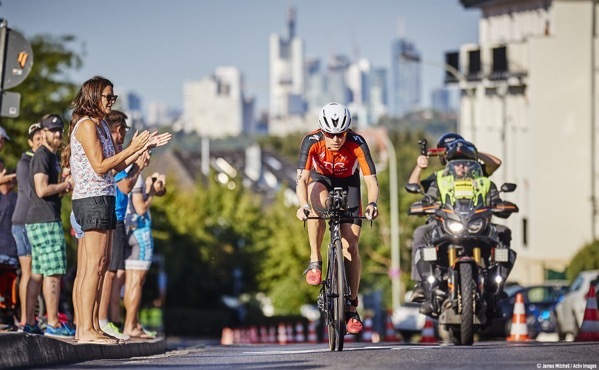 T: What were your expectations going into your first Ironman race in Frankfurt? S: Before the race, Dan was very straightforward with me: the goal was to qualify with Kona with a Top 7 finish and we didn’t feel as though I had yet done the work to have a great race. We were conservative with the effort and it ended up better than expected. There’s always a fear of the unknown and I was definitely nervous; my longest run was one 32km run and I had no idea whether I could run a marathon off the bike. The most surprising thing for me was that good nutrition and pacing could make up for being underprepared in training. T: Please describe the way from Frankfurt to Kona. How did 70.3 Champs fit in? What have you been focusing on, how has the training changed compared to before Frankfurt? S: When Dan and I talked in December, I stated that my one goal for the season would be Kona and we’ve structured the year accordingly. It’s been a very slow, gradual build and we should have me in peak fitness mid-October, barring any unforeseen hurdles. After Frankfurt, we took a couple of easy weeks and then started to build up to 70.3 Champs. Dan felt as though the timing for 70.3 Champs was ideal. I like Championship racing, so it was worth choosing a bigger, competitive race than a 70.3 with a weaker field. Fast races are great training and preparation for goal races like Kona. S: About 30km in, I lost my nutrition and flat kit. 10km later, that proved to be a problem when I got a flat. It’s probably more accurate to say that I had one flat that I couldn’t fix properly; I used Pitstop to fix it but it didn’t hold for long. Fortunately there was mechanical support, but I had to wait for a while. I wouldn’t have been able to continue racing without them, so I’m grateful they were on the course. T: Have you been to Kona before? What’s the goal for your first Kona? S: I’ve never been to Kona, so I’m really looking forward to the experience. I will be on the Big Island between 70.3 Worlds and IM World Champs, so I’ll get to know the course and conditions well. I want to show up to the start line fit and prepared for a great race. I can’t control how others perform, so ultimately it’s about bringing my best to the race and trying to let my preparation shine. It’s such a tough race; so many incredible athletes struggle with adversity there, so I know better than to have any clear outcome goals. That said, it’s very expensive and I have to figure out how to pay for my travel expenses. Finishing in the top-10 would help. T: Tactically, where do you see yourself “fit” in the Kona field? S: Honestly, I only have a vague concept of how I’ll fit in the field. We were definitely conservative in Frankfurt, but the conditions of Kona also warrant some caution. With Kona, I’ll be surrounded by 34 other terrific and experienced IM athletes. I’m guessing that I won’t be that lonely! The key will be using others to help me perform to my best without getting too excited and pace harder than I can manage. T: How surprised were you by your 2:54 in Frankfurt? And what do you think you can run in Kona? S: Before the Frankfurt, I asked Dan about pace and his answer was funny: “I have no idea. Until you race an Ironman, I can’t give you an estimate”. I used pace to make sure I didn’t go out too hard the first 10km, but I just relied on perceived effort. It didn’t feel that hard, so I’d like to think that I can run faster in similar conditions. Of course, I’ll be biking harder, so that will impact my run. While the temperature for the marathon in Frankfurt was similar to average temps in Kona, the humidity is much higher in Hawaii and that will slow me down. How much? I have no idea!